Most people are now familiar with using a mobile device to access the internet and purchase goods. Doing so via an app rather than by mobile internet is the best way to do it for lots of reasons and so Twistfix have created our very own mobile app for your convenience. Why download? Read on to find out…. It’s FUN: app users will be able to join in exciting competitions to win cool tech prizes such as the Apple iPad mini and Sport Watch we have given as prizes in the past. It’s CURRENT: we will continue to work with our digital agency to ensure you get the most modern experience, updating the app where necessary. We want to make things as smooth, practical and aesthetically pleasing as possible to optimise your time spent using the app. Product updates will happen automati­cally, meaning you always get the most accurate information at your fingertips. It’s INFORMATIVE: we have worked hard to create a complete set of how-to guides that facilitate your work with our products. Clear, competent and reliable, these guides are immediately accessible through the Twistfix app. 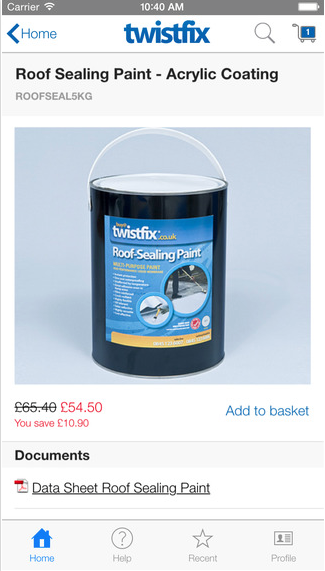 Get the Twistfix app today and start enjoying YOUR unlimited 2.5% discount.